OK, this is the kind of setup that screams "Flucke, you've got to buy me!" 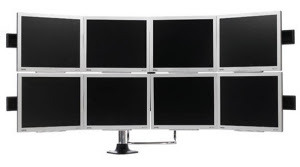 This incredible 8 monitor setup is made by a company called Humanscale and the frame setup itself is called the Paramount Parabolic Multi-Monitor Display. It is a frame that allows up 8 monitors to be attached and used. It literally curves around the user so that you can be surrounded by the monitors for easier orientation and viewing. Studies have been done that show users experience a 20% increase in productivity when using 2 monitors. I can't imagine a 160% increase in productivity, but I can imagine a definite ability to get more done. In my case, a setup like this would allow me to have a separate monitor for my Eaglesoft schedule (that dynamically updates), my e-mail, Google reader, a patient chart, patient images (for diagnosis and editing), Winamp for music, and still have 3 screens leftover. The frame is due to be released sometime in the first quarter of 08, but I have no word on pricing. More info can be found at the company website.